the smallest piece of my vision board. Only now am I beginning to understand the truth of that statement. Which is so crazy — no, magical — to me because I seldom gave the sentence my attention. Even during my daily visualizations when I would literally stare at the board with focused intent; it was so small it was easy to overlook. Then recently when I took notice of it again, it hit me hard and realized, wow. It is true. 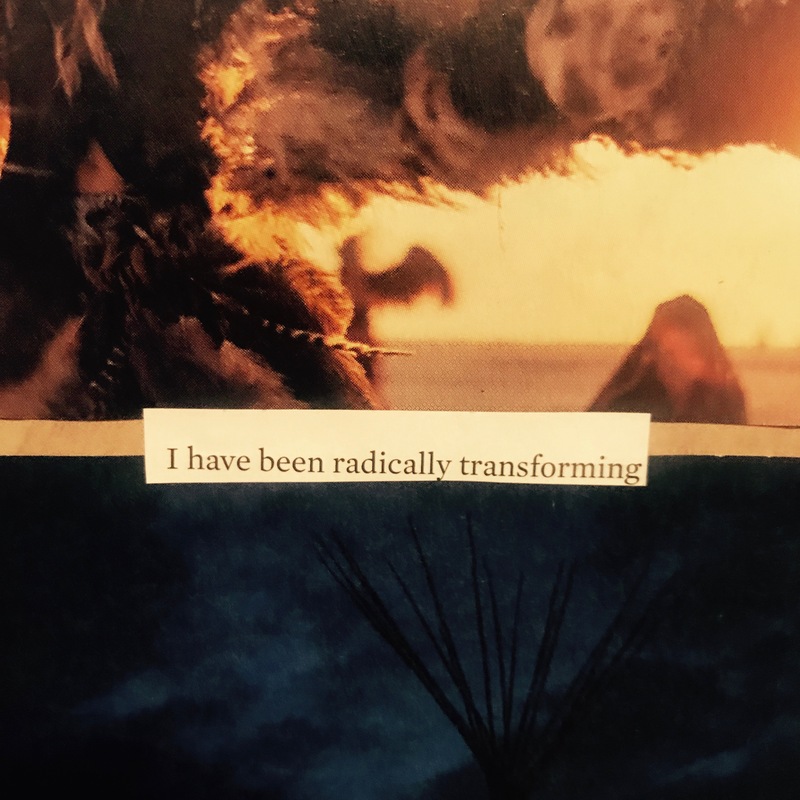 I have been radically transforming. Now I see my transformation quite clearly. I have experienced a myriad of changes, mostly internal, some external, for the last 8 months. And they have been all for the good. Even the things I struggled with or fought mightily against. Most especially the things I struggled with or fought mightily against. It has all been for the growth of my spirit, the attainment of my highest possible self, the fulfillment of my soul’s mission. It feels like individually they are each a small piece of a bigger plan. Yet collectively they are indeed radical. In fact, life transforming. These changes, some of which are terribly mundane and others which are huge for me, are too tedious to list. Suffice it to say I have lost some things along the way: bad habits, negative people, needy friends, 19 pounds. And I have found some things along the way: a passion for running uphill, the power of meditation, the art of allowing, the difference between being and doing, and a new attitude about time. You + self-invest = everything. One of the biggest changes I’ve made is allowing myself the time to self-invest every day — even if it takes more time than I would have previously allowed. For instance, I love to run the trails in the hills that surround us here in Middle Tennessee. My favorite ones are literally an eight minute drive up the road. I also have two dogs who love them as much as I do. Their exercise is as important to me as mine is, but until the start of this year, I would choose one or the other because I felt a pressing need to get back to the office to check off my list so that I could feel accomplished at the end of the day. It took me awhile to understand that this is old conditioning of “doing” versus “being.” This is so tricky to uncover because it can be buried under layers of productive accomplishment that your ego feels really, really proud of. I used to choose them or me because I took greater satisfaction in checking off my to-do list than I did investing in myself. The irony is when I am in the woods my soul is fed in a way that I cannot replicate anywhere else. I get still and quiet and inspiration in all forms flows to me effortlessly. I solve problems. I find answers. I talk to my version of god and to my guides. I see beauty everywhere. And always, always, I feel an overwhelming sense of abundance. In the woods is where I know for certain that life is lush and limitless, and it fills me with gratitude and appreciation. It shifts my perspective. It awakens my spirit. It sets the course for my day. Ever since I vowed to get out of the way on New Years Day, I no longer choose them or me. I take the dogs first and walk in an active silent meditation. I experience great joy in the way our 1.5 year old puppy explores and bounds ahead while our old lady rambles more slowly and predictably by my side. Their pleasure gives me pleasure. Then I take them home and head out for my solo run, letting myself be guided to the trail I need to experience; and taking care to notice the magic and signs presented to me along the way. If you are a seeker, you will find that this is not new or decidedly different from anything else you may have read. And yet if there is one universal law to spiritual growth that I’ve most certainly found to be true, it is that the message needs to be presented numerous times and in different ways for it to finally resonate and take root in your psyche. Self-invest has so much more power than self-care. Self-invest has energy around it. Not unlike investing money, it pays dividends and interest over time. It gives you permission to do the things you know you should do to care for yourself because you are investing in yourself: your future, your body, your mind and your health. So of course you should. Your time invested in yourself will multiply your rewards and show up for you in ways that elevate literally everything: your energy, your mood, and most importantly, your vibration. Self-care is like a wish. Something you can put off for the future, you know, when you have time. If you are a giver or a pleaser, self-care is almost an oxymoron — aren’t you usually last on the list? And by then, who has the strength? Who has the time? Self investment is perhaps the smartest use of your time every day. It is where it all begins. It is what gives you strength, makes you feel invincible, makes you feel alive. And you, my dear, deserve all of that. Life is lush. And you are limitless. by Patricia Omoqui, The Thought Dr.